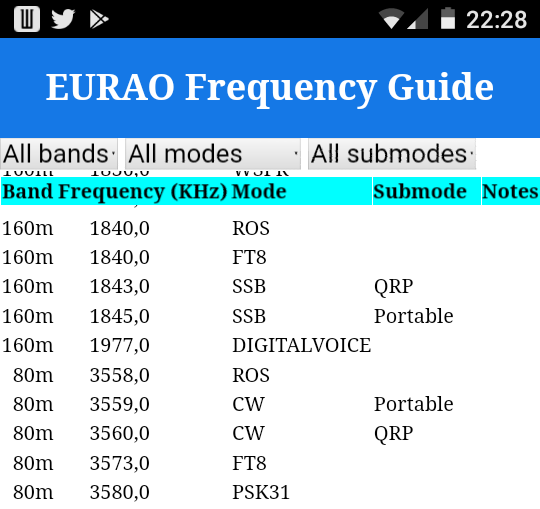 As a result of data collected for EURAO Parties, a kind of QSO events held once in each season, a database has been created with most popular frequencies, modes and applications. Now this database is available online, either by computer, mobile or tablet, and you can select easyly the band, the mode and/or the application you would like to consult and get an immediate response. Give it a try and let us know your comments, ideas, mistakes, modifications, ... in order to improve the project.